What shall follow in subsequent entries will be information that I’ve been able to gather on these wonderful planes. 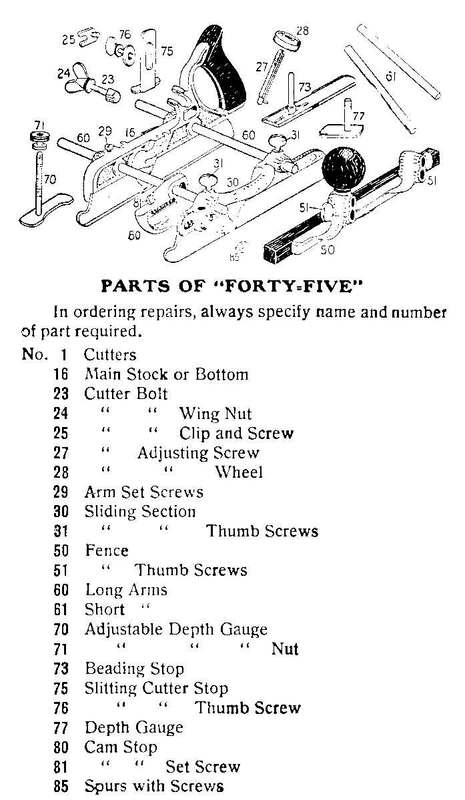 I won’t claim to be an expert on the subject matter, but rather someone with a profound interest in the uses of a Stanley #45. I will use this first entry to maintain a list of outside references that I have found useful. If anyone has any suggestions for references pertinent to the #45, I would be more than happy to entertain them. I will do my best to update things as I go. Thank you for joining me in my journey to better understanding the #45. Replacement Parts from St. James Bay Tool Co.
Great thread Mos … ill be watching with interest. And of course ill also find myself wanting one in the end. My wallet hates you. I on the other hand …. uhmm … dont. I look forward to following this blog. You already have mentioned most of the good links for detailed information relating to this plane. Like most combo tools, my #45 does several things well, but not exactly perfect for any of them. Mostly, I use mine as a plow plane and then occasionally for beading. I also have a #78 that is easier to use for cutting rabbets. Anyway, good information and look forward to following this. If you can, I would be interested in seeing some video on actual use of the plane as part of this series. Interesting reading about the slitter which seems to be a kind of cutting gage. Somebody once pointed to a video of a Japanese woodworker who was cutting (not simply marking) thin boards with a cutting gage. The other links are also interesting, I have myself pointed to Al’s site here several times. to get a broader audience. The site of Al is not limited to one type. Various tricks might be interesting for owners of other make and model. I am looking forward to the growing of the reference list. This is going to be great… Thank you for taking the time to do this Mos. “And of course ill also find myself wanting one in the end.” ... Yep, Stef typed that and hit enter. One of my favorite planes! Great reference material. Thanks for doing this! Doc, there shall be video in following blogs. I intend to go through as many of the uses that Stanley lays out with pictures and video. I’ve already done videos for Match, and Dado, and will be making some more soon. Sylvain, I’ve tried using my slitter once before, but it didn’t work the greatest. I think I need to get it sharper, and take it less depth at a time. Something I’ll be working on later, I suppose. Quite simply, because I don’t have any of the similar planes lol I’ve got a #45, and a pair of #46s. I want a #55, but that’s going to have to wait for a while. I’d like to upgrade my #45 first, as mine is in somewhat rough shape in some areas. poopiekat, The #45 is also one of my favorites (if not the favorite, but don’t tell the rest of them that). 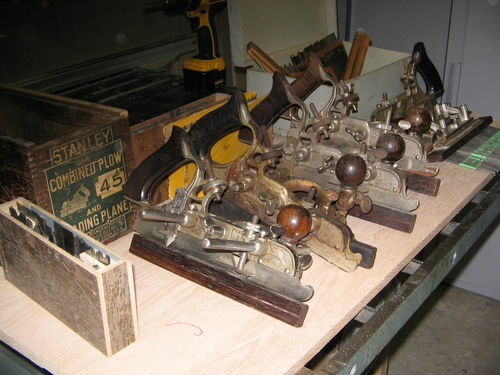 It’s easy to find a lot of information on how to use bench planes, and even molding planes to an extent. But trying to find good information (with pictures and/or video) of a #45 being used isn’t the easiest thing to do. I’m hoping that this blog series will eventually help fill that void. 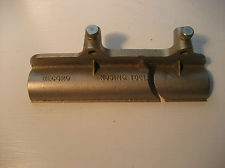 I’d like to see some of those auxiliary molding shoes that are used with the more complex profiles. I’ve only seen a few on eBay, most memorable was an entire set of shoes (not sure if that’s the right term) or is it ’soles’? for a #45 that went for perhaps a few thousand bucks. yikes. Could any #45-55 be complete without ‘em? Thanks, Mos! There’s none currently listed on eBay, that I can find. Here’s a “record” plane equivalent, so that those who are curious can see what they are.. Fences seem to be a dime a dozen, unless you’re going for an identical period replacement. I’m afraid a #55 is going to come up for bid, and if I get my hands on one, I’m sure my head will explode! Great resource Mos, I appreciate you trying to fill the information void on the #45. I havent broken mine in yet. I’m going to have to make one of those boxes that Roy made with is to get warmed up to it. Do a rabbet instead or one of those locking tongue in dado joints, its more #45 centric. The other thing I think I would change about the box is that lip, I would rather do the offset rabbets inside and outside the box that interlock when you cut box open. You ever see that, I cant find a picture of it right now for some reason.